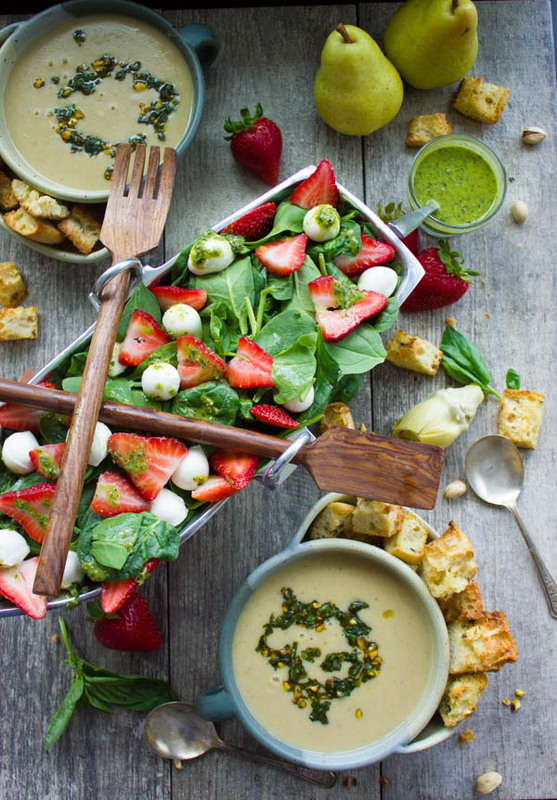 Serve this healthy Strawberry Spinach Salad with a steaming bowl of Artichoke Soup for a winning Mother’s Day Brunch or light lunch! 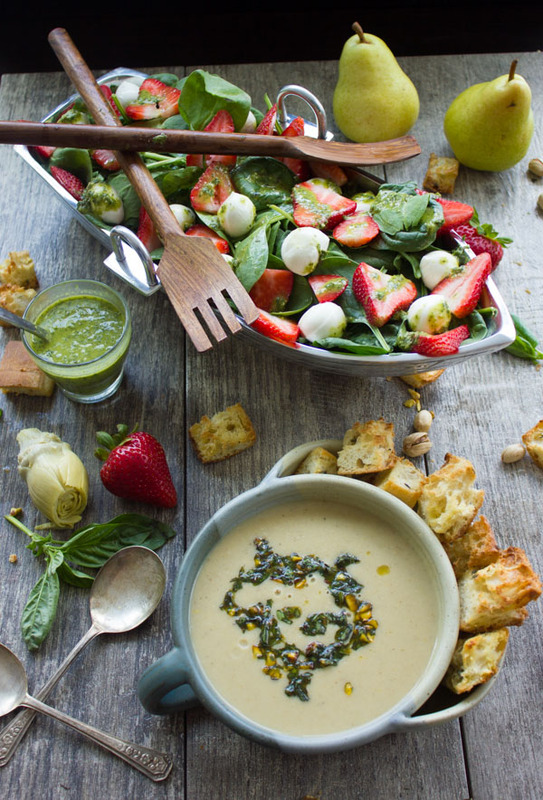 Here’s a Strawberry Spinach Salad & Artichoke Soup Brunch recipe combo that’s absolutely the best way to celebrate this beautiful season! Light, fresh, vibrant and so so DELICIOUSLY good! 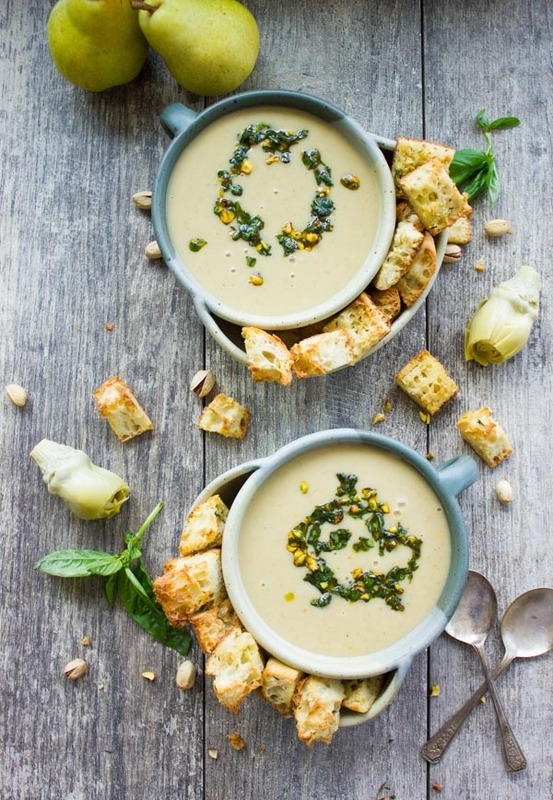 Picture a vegan, super creamy thick luscious artichoke and pear soup drizzled with a basil pistachio olive oil topping for a perfect finish. 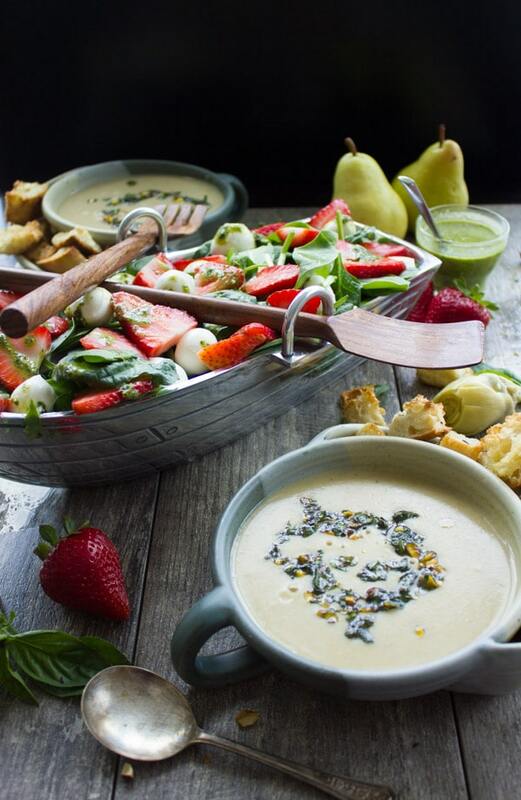 Pair this delicious Vegan Artichoke Soup with a seasonal Caprese-style Strawberry and Spinach Salad with Mini Mozzarella. A light and refreshing Mediterranean salad dressed up with a zesty citrus basil vinaigrette! The soup paired with the Strawberry Spinach Salad makes for a fabulous lunch or brunch for Mother’s Day. This easy Caprese-style Strawberry Spinach Salad is simply perfect for picnics, lunches, potlucks and BBQs! Served with a steaming bowl of artichoke soup, it makes for a delicious, satisfying springtime meal. For the vegan artichoke soup: heat the olive oil in a medium size pot, and add in the onions, bell peppers and a pinch of salt. Sauté the veggies for about 3 mins until soft and slightly caramelized. Add some garlic along with some oregano and sauté for a minute more until fragrant. Add in the remaining soup ingredients and mix. Bring the vegan artichoke soup to a boil and lower the heat to low. Let the vegan artichoke soup cook for about 20-30 mins. 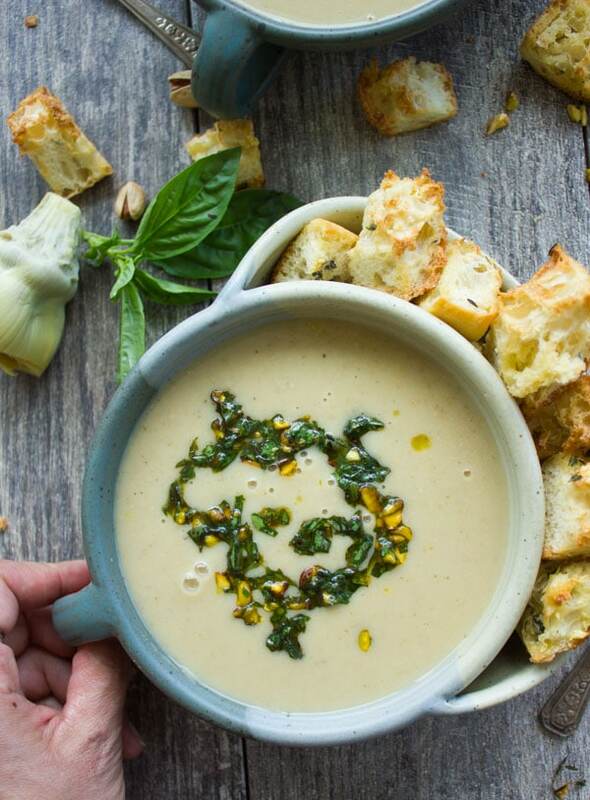 Use an immersion blender to puree the vegan artichoke soup to a smooth velvety texture. Taste the seasoning and adjust to your liking. Now let’s talk about the divine herb topping, which, in French Cuisine talk, is often referred to as pistou. It’s simply a combo of chopped pistachios and basil, mixed with olive oil and salt. This tiny bit of 2 mins work makes a BIG difference to your vegan artichoke soup! 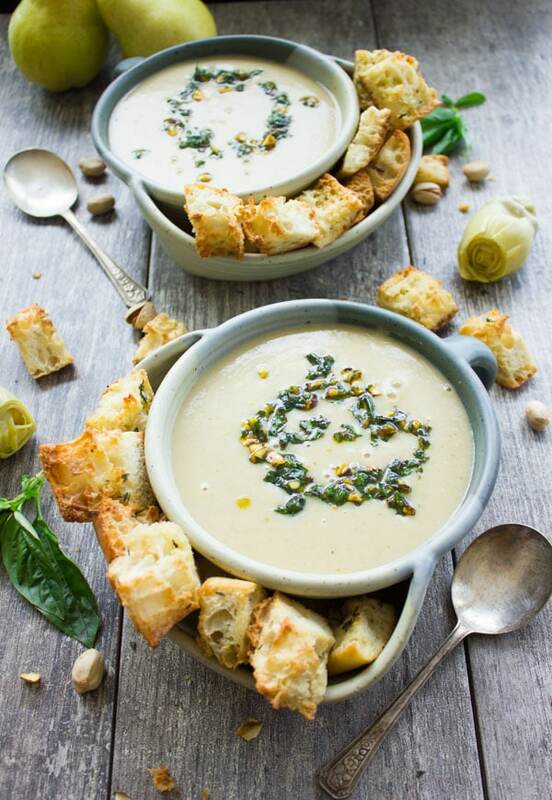 The pistou adds a delicate crunch to the artichoke soup and a bright basil pistachio flavor. Served up in my new favorite soup bowls with croutons—perfection! And served along with the strawberry spinach salad with basil vinaigrette—a dream come true! For making the pistou, simply mix all ingredients in a small bowl. Serve the vegan artichoke soup topped with a teaspoon of pistou. This Strawberry Spinach salad comes together in minutes. 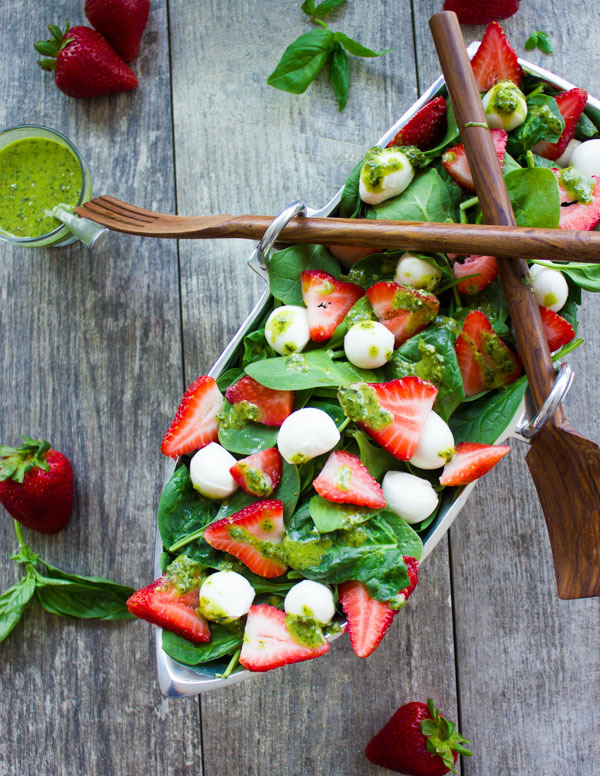 Simply place the spinach on the salad plate, scatter the strawberries and bocconcini over the spinach and make the dressing. The basil dressing is made in a blender or food processor—plenty of basil, some garlic, some vinegar, some olive oil and mustard. Toss and drizzle this healthy low carb Strawberry Spinach Salad with this homemade basil vinaigrette and you’ve got the brightest, healthiest salad ever! You can definitely toss in some croutons to your strawberry spinach salad for a more filling lunch. For now, we’re keeping the croutons with our velvety smooth artichoke soup only. This simple salad and soup combo comes together literally in 30 mins start to finish, and it makes a perfect brunch menu this season—so don’t miss out! 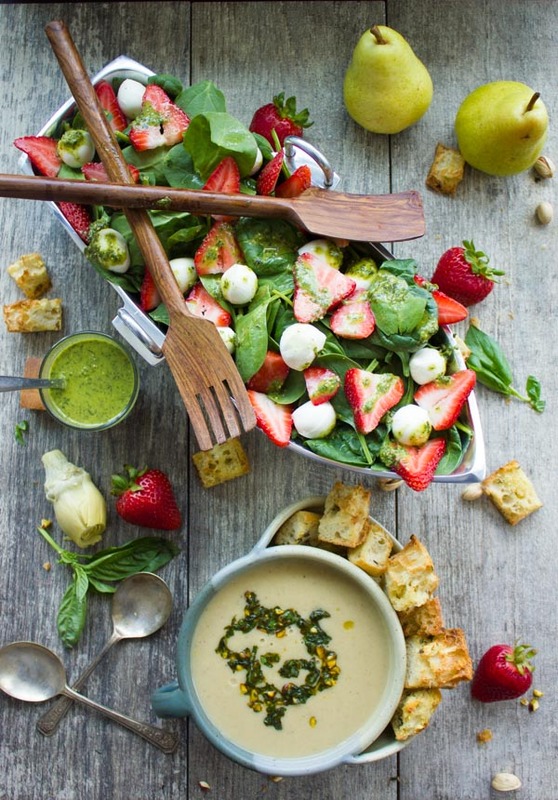 If you’re serving this Strawberry Spinach Salad vegan, skip the bocconcini. My secret thickener for this artichoke soup is navy beans! The beans not only add protein and fibre to the soup, but they add a luscious creamy texture without any actual cream required. I also love adding a 1/4 cup of rolled oats to the soup. Again for thickness and to mellow out all the flavors. Adding pears/apples to my soups brings a touch of sweetness into play and takes this artichoke soup to the next level. For more artichoke recipes, check out this lemon artichoke garlic roast chicken with salsa or this lemon caper artichoke chicken piccata recipe. 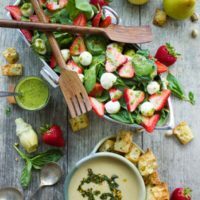 Serve this healthy Strawberry Spinach Salad with a steaming bowl of Artichoke Soup for a winning Mother's Day Brunch or light lunch! Preheat the oven to 375 degrees. Toss all the croutons ingredients and layer them in a single layer on a baking sheet. Toast them in the oven for 10-15 mins (depending on the size of your croutons). Let them cool. For the soup: heat the olive oil in a medium size pot, and add in the onions, bell peppers and a pinch of salt. Sauté the veggies for about 3 mins until soft and slightly caramelized. Add int he garlic, oregano and sauté for a minute more until fragrant. Add in the remaining ingredients and mix. Bring the soup to a boil and lower the heat to low. Let the soup cook for about 20-30 minutes. Use an immersion blender and puree the soup to a smooth velvety texture. Taste the seasoning and adjust. For the pistou—simply mix all ingredients in a small bowl. Serve the soup topped with pistou. For the Basil Vinaigrette: blend all ingredients in a processor or high-speed blender until smooth. For the Salad: Toss the spinach with 2 tablespoons of the vinaigrette. 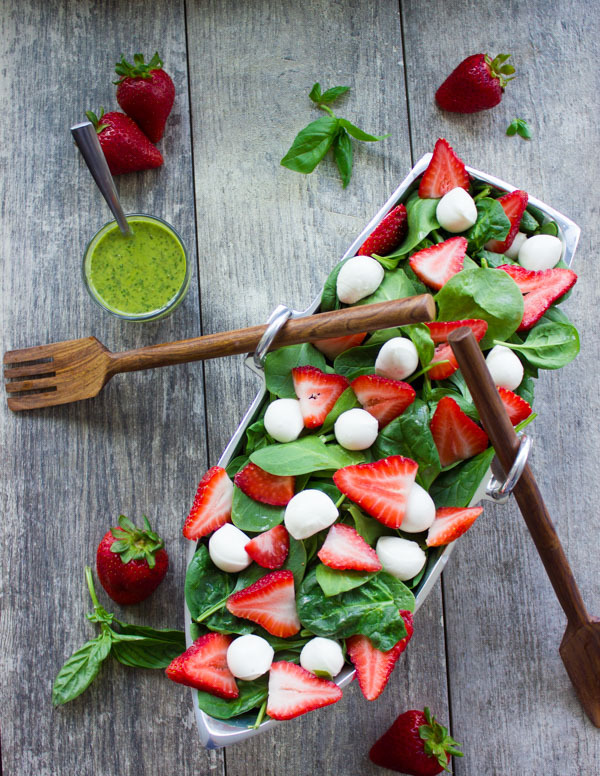 Place the spinach on the salad plate, scatter the strawberries and bocconcini over the spinach and then drizzle with more of the basil vinaigrette to your taste. 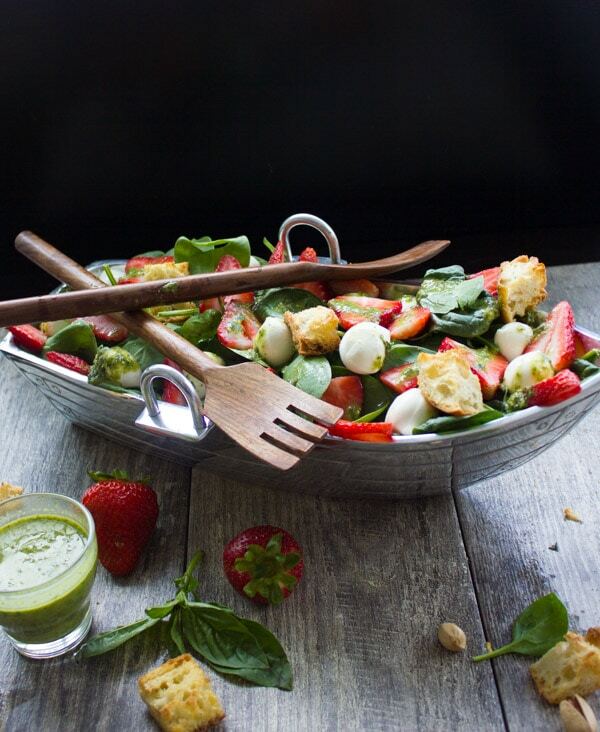 If you're serving this Strawberry Spinach Salad vegan, skip the bocconcini. My secret thickener for this artichoke soup is navy beans! The beans not only add protein and fiber to the soup, but they add a luscious creamy texture without any actual cream required. This looks and sounds absolutely wonderful….my mouth is watering and now all I want is to host a brunch! 🙂 Thanks for sharing! Jayne Thanks you!! Hope you make it! I love everything about this post! From the recipes to the serving dishes! Absolutely love it! What a beautiful salad this is! I’d love to make this for mother’s day brunch as I think mom would totally love it, yum! I would love to try both the soup and salad. Beautiful clicks! Both those recipes sound gorgeous, but I have bowl envy they are stunning. Beautiful styling & photography too. That row boat salad bowl is adorable!! The salad you made looks so good. Our strawberries are getting bigger. Can’t wait til they are ripe enough for this salad! I’m sure your mama will love those bowls you chose for her. 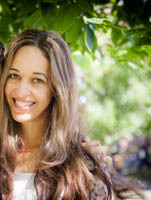 They are so pretty and unique! Love the decor from uncommon Goods. Have never heard of them until now! And my mom actually loved those soup bowls so much!! I love how unique every piece is!